Abstract: There are a number of aesthetic issues that may occur as a result of periodontal disease and/or its management and it is a common motivation for patients to seek treatment, particularly when it affects the anterior teeth due to their prominence within the dentition. Clinicians and patients are becoming increasingly aware of the importance of the periodontal/muco-gingival tissues to provide an aesthetic smile and, as a result, this has led to the development of both surgical and prosthodontic techniques to improve or maintain the dental aesthetics. 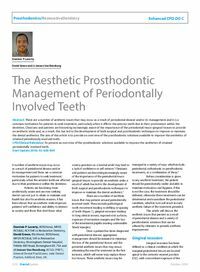 The aim of this article is to provide an overview of the prosthodontic solutions available to improve the aesthetics of retained periodontally involved teeth. Clinical relevance: To present an overview of the prosthodontic solutions available to improve the aesthetics of retained periodontally involved teeth. Author notes: Dominic P Laverty, BDS(Hons), MFDS RCS(Ed), ACF/StR in Restorative Dentistry, David Green, BSc(Hons), BDS(Hons), MFDS RCS(Ed), StR in Restorative Dentistry, Birmingham Dental Hospital, Pebble Mill Road, Birmingham B5 7SA and JJ Jansen Van Rensburg, BChD, (PRET), General Dental Practitioner, Jade Dental Practice, Ashford, Kent, UK. Objective: To highlight aesthetic issues that patients may present with as a result of periodontal disease and offer a variety of prosthodontic solutions that can be utilized to improve the aesthetics in periodontally stable patients.